A famous Korean superstar girl band, arriving in Singapore recently to give their fans an unexpected surprise amazing concert performance. 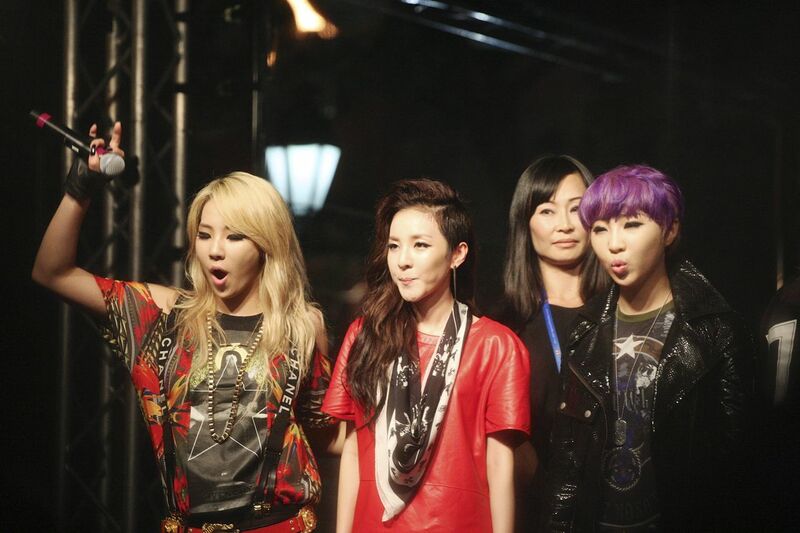 Knowing the K-Pop craziness and following in Singapore, Singtel brought in Korean Superstars 2NE1 into Singapore and they gave an awesome live performance at the Read Bridge in the Clarke Quay area. I was invited by Singtel and was very honoured to be part of this awesome surprise and special performance, close to the stage and watching the beautiful 2NE1 gave an outstanding and rocking outdoor performance. The atmosphere was amazing, many 2NE1 fans packed on the Read Bridge at Clarke Quay, screaming and singing along with 2NE1 songs. This performance by 2NE1 was unannounced and as word of 2NE1’s appearance quickly spread online, more than 1000 excited K-Pop fans flocked to the bridge to watch their idols perform a high-energy set, which included smash hits: I Love You, Fire, I Don’t Care, Can’t Nobody and Clap Your Hands. Crowds also gathered to watch the performance live on giant outdoor screens at Knightsbridge, Bugis Junction, JCube and Toa Payoh Hub. This surprise concert was broadcasted live too with the use of apps and social media. SingTel leveraged its multimedia capabilities to stream live footage of the performance through its new Amazapp mobile app (You can download them on iTunes or Google Play). The cutting-edge app also offers exclusive unreleased videos that give fans a behind-the-scenes peek into the lives of band members. SingTel also aired the showcase live via mio TV, as well as its website and Facebook page, thus providing fans with several ways to experience the event. Fans can download recordings of the performance through SingTel’s award-winning AMPed music service, as well as a variety of mobile ringtones and wallpaper. Photographing a Korean Pop music concert was a first time for me! It was very fun and challenging with the space constraints, nevertheless, I enjoyed the concert by 2NE1 a lot and managed to get some nice photographs of 2NE1 superstars singing and dancing! During the performance, the leader of 2NE1, CL, asked the fans to jump and wave while singing along! The bridge was rocking to 2NE1’s magical performance and her fans dancing along with the beat and flow! Dara/ 다라 of superstars 2NE1 was performing quite a lot in front of where I was standing, therefore, I was able to capture quite a number of beautiful photographs of her! 2NE1’s surprise concert performance was magical and amazing, when they are back on 1st December for their first full concert tour in Singapore, I am sure they will rock the world and bring the house down! Stay tuned to the Singtel Facebook Page for more Amazing updates!